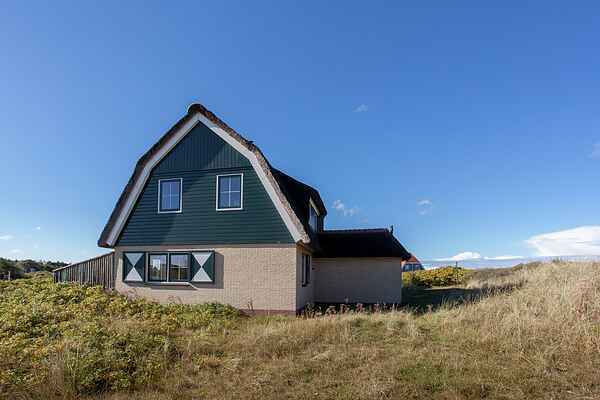 This holiday home with thatched roof is situated in the middle of the dunes of the Dutch Wadden Island Vlieland. From the large patio of the villa, you look out over the various holiday homes in this wonderful nature reserve of Vlieland. This villa has all the luxuries and comfort for a relaxed holiday. After a long day at the beach, you can have an extensive meal with all your companions. The charming (gas) stove is perfect for the cooler evenings. While the children play a game, you can enjoy a glass of wine in the seating area and take the time and quiet to chat and catch up. From your holiday villa you can easily walk or cycle to the centre, where you will find many charming restaurants, cafes, shops and a supermarket. If you would like to take in a bit of culture, there is a special walk along the historical buildings on Vlieland, which is highly recommended. On Sundays you can wander along the market stalls and get yourself a bargain. Additional information: We advise you to book the boat trip in advance. Via Doeksen you can easily order your boat tickets. Free luggage transport: your luggage will be transported free of charge to your holiday address and vice versa through luggage transport “Wietske de Boer”. On arrival they can be recognized by the white vans with red print. Note: Please include here the local name of your holiday address as listed in your tickets. In your house there is 2 cribs, 2 high chairs, 1 babybath, Extra Cot and/or high chair is for rent (€ 10.00 and € 5.00 per stay). The linen for the crib will be payed on the spot.